Bobotie is a slightly sweet, spiced minced dish. The Cape Malay Bobotie recipe is a traditional version that makes a spicy, slightly sweet dish, with a very light curry flavor. Soak the bread in water for 10 minutes, squeeze out the excess and then crumble. In a large frying pan, heat the oil and braise the onion until golden. Add the onion mixture from the frying pan, the hot water, lemon juice, crumbled bread, turmeric and sugar to the mince, mixing well. Spoon the mixture into a well-greased, oven-proof dish and bake for 40 minutes, or until golden brown and then remove from the oven. Combine the other egg with the milk and beat well. Pour the mixture over the bobotie and arrange the bay/lemon leaves as garnish. Return to the oven and bake at 350o F for 10 minutes, or until the topping is set. Serve the Bobotie with a large salad and rice. This is a very good Bobotie recipe – not too spicey, just right. Lovely recipe, but a traditional babotie always has raisins and apricot jam in. 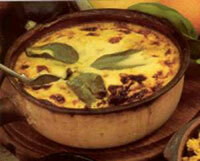 I have also heard that this dish – Bobotie – can be cooked [baked] in a Pumpkin. Any thoughts?